Bountiful Botanical Blessings on you for recognizing the beauty of the “Sprout.” Brussels Sprouts: grow them for a fun fall harvest, eat them for high levels of Vitamins K and C, and enjoy them for sweet and nutty flavor. Of course, all these amazing benefits depend upon your knowledge of how best to plant, harvest, and prepare these cute “little cabbages.” And we’re here, to help. First, give them a good sunny home. Note, however, that if your region has very hot weather in late summer and early fall, the plants will appreciate the respite of light afternoon shade from other taller plants, trees, or shade cloth. They prefer a medium to heavy, firm, fertile, neutral soil with a pH of 6.5 to 7.0. 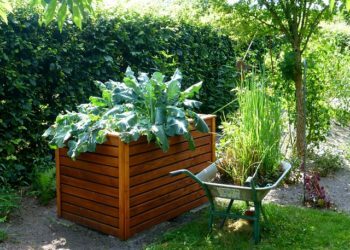 To ensure the soil’s appropriate texture and fertility, be sure to mix in generous amounts of manure or compost and water the garden bed several days before planting, to allow the soil to settle. A soil tester can quickly and simply indicate your soil’s pH level, which you can then adjust with either garden lime, to raise the pH, or aluminum sulfate, to decrease the pH. 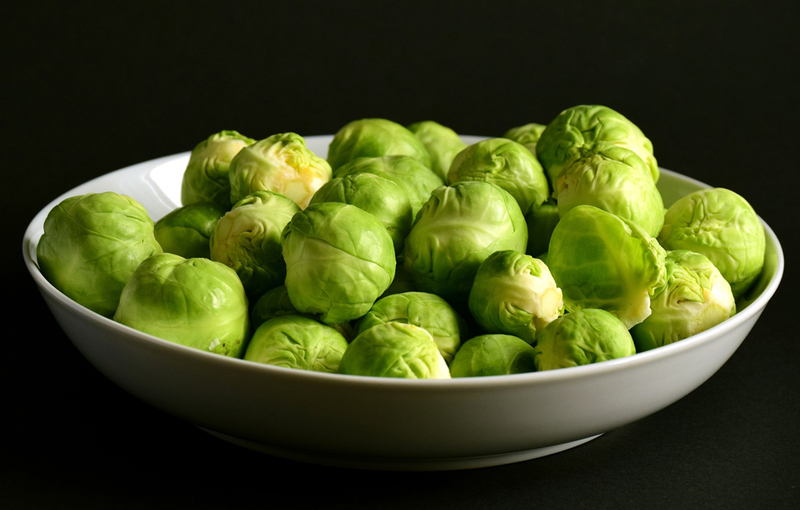 To ease their transition, apply vegetable fertilizer when transplanting the Brussels Sprouts, then feed them with a nitrogen-rich fertilizer when they are about 12 inches tall. This is especially important if your plants are facing late summer heat, which can stunt them and cause bitter flavor. Of course, water regularly as needed and apply soil conditioners every 6 weeks to further enhance production and ensure a long, flavorful harvest. Once the Sprouts begin to form, they will grow up the stalk, forming a unique-looking “palm tree.” You harvest them in the same way as they grow, from the bottom of the stalk, up. Something so satisfying about twisting off a mature and succulent little Sprout, bound for your kitchen! 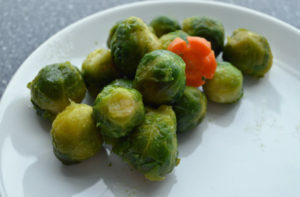 When preparing, remember that overcooking is the death of Brussels Sprouts flavor (and nutrition.) They can be steamed, roasted, grilled, baked, sauteed, and nestled into casseroles. The Internet is full of inspiring recipes. Just don’t boil them into mushy submission! There is just no comparison between the taste and texture of home-grown Brussels Sprouts and those purchased in supermarkets. So go ahead and take the plunge. Brussels Sprouts may just be your family’s favorite fall dish they never knew they were missing! I live in south central Indiana and we are having a hot summer this year. My landlord says that brussel sprouts will not do well in our area, but I am giving them a try. Right now they are tall enough to thin out, and I am giving them lots of water. Certainly getting good green plants so I hope I can prove my landlord wrong. We would also suggest a shade cloth to help keep the temps down on your Brussels. I noticed that all the leafs were torn off from the bottom jut leaving the tops. Are you supposed to do this? Jennifer, you do not have to remove the lower leaves. 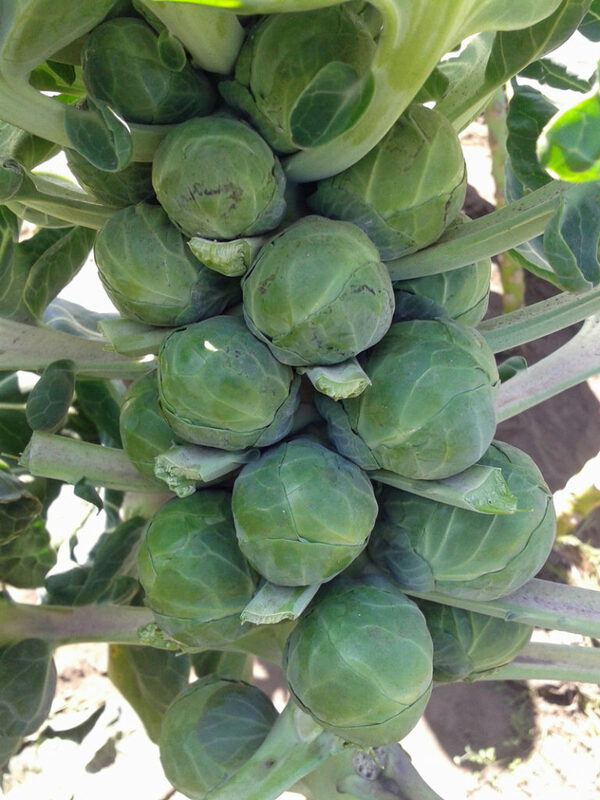 The larger growers feel that the lower leaves are not needed once the sprouts have formed, so they remove a few at a time over the growing season till you have what is left in the photo, which is a brussel sprout plant that is ready to harvest.